CCA System allows for data submitted to be analyzed online; downloaded as a subset or whole; or even queried in real time using the CCA REST API. Below are images of online analysis examples. For practical examples see the analysis section of Walkthrough I and II. Consult the REST API page for information on how to query and analyze data in real time using third party applications. 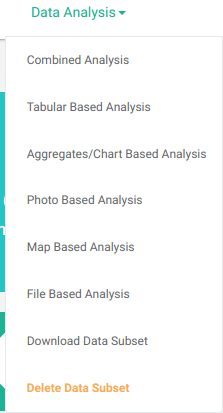 The items of the Data Analysis menu are as shown above. The Aggregates/Chart Based Analysis or the Combined Analysis menu item grants the ability to query, filter, download and display data as tables, Bar, Pie, Line or Area chart to a user with the Analyst designation or an Admin user with the View Data role set. An example is shown in the image below. 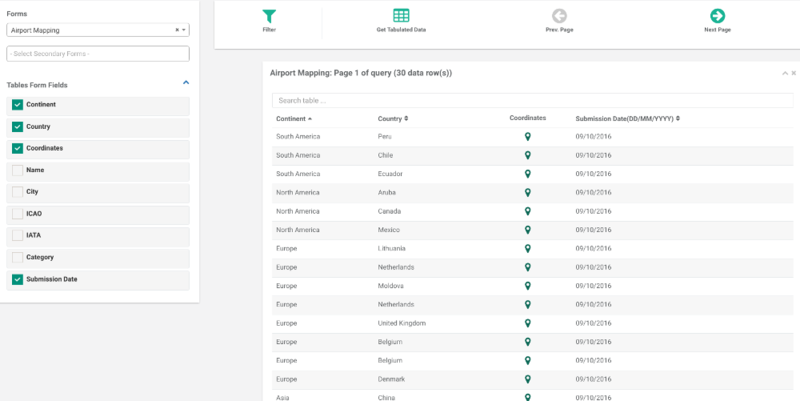 The Map Based Analysis or the Combined Analysis menu item is used to plot map locations on Google maps for forms that have fields that contain GPS coordinates. See an example in the photo below. To analyze forms fields that capture images use the Photo Based Analysis or the Combined Analysis menu item. The image below is taken from the Example II walkthrough example. Alternatively, numerical, textual, image or file data can be analyzed “as is” and displayed in a table as shown in the image below. This is done through the Tabular Based Analysis or the Combined Analysis menu items. Finally, if the data collected include attached files, these files can be enumerated on a table as shown below. A file is either downloaded or displayed once the green file icon is clicked. Use the File Based Analysis or the Combined Analysis menu item for this. For direct answers to questions regarding the Data Analysis menu, the reader should see these FAQs.